Success is often followed by dalliance. Not always, often. The Q5 wasn't just one of Audi's most successful products of all time, it also dominated the luxury SUV space, not just in India but in just about every market since its inception in 2008. At the time it was an incredibly spacious and capable on-road SUV that could do sufficiently well on untarred terrain. It married that performance very well with technology that made life inside the Q5 extremely comfy. Since then, a plethora of able alternatives have cropped up like the Land Rover Discovery Sport and the Jaguar F-Pace, not to mention its traditional German rivals in the BMW X3 and the Mercedes GLC. The rivals have enjoyed a free rein and caught up with the Q5 but now Audi has had enough. It wants its pie back and it wants it now. Enter the all-new second-generation Q5. But how does it earn back the kind of dominance it enjoyed once upon a time  let's face it  this time around its competitors are very very capable. 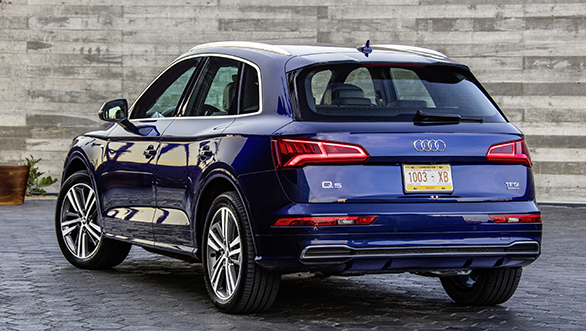 A new generation simply has to differentiate from its predecessor and that the Q5 does. What it retains is the handsome stance and elegant proportions drawing inspiration from its low-slung siblings the A4 and A5. It is after all based on the new A4/A5's MLB Evo aluminium and steel platform. 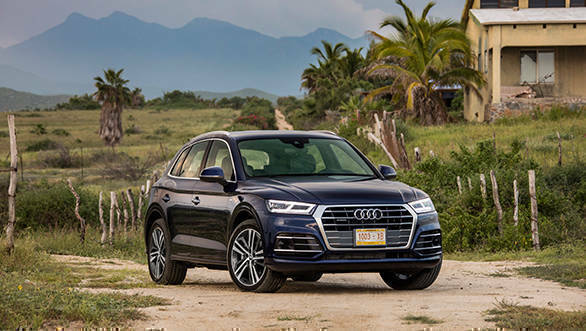 Something that has always worked in favour of the Q5 is that unlike other SUVs it competes against, it isn't boxy  its lines and contours are very sedan like. 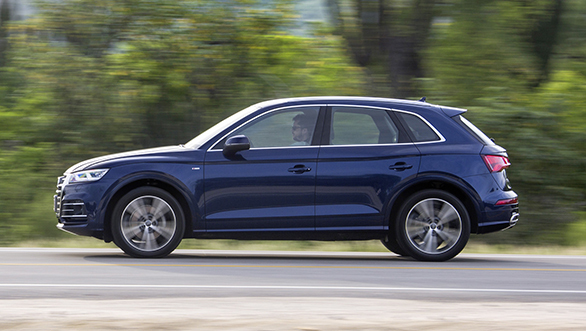 The new Q5 is no different and it now takes cues from the latest generation of Audi saloons. The result is that it's got more brawn than before aided by an increase in overall dimensions. It's what Indians have grown to want  a car that's as capable as an SUV but looks as car like as possible. The single-frame front grille dominates the facia  something we're getting used to. The pillars continue to be raked at un-SUV like angles. The Q5 benefits from the Matrix LED headlights which are technological marvels in themself but not unseen before. At the rear the tail lights get a makeover too with sequential LED elements. The boot gets an electronically controlled tailgate as standard and can accommodate 550 litres of luggage expandable to 1,550 litres with the rear bench folded. The changes insides definitely have a far greater aesthetic impact on passengers. 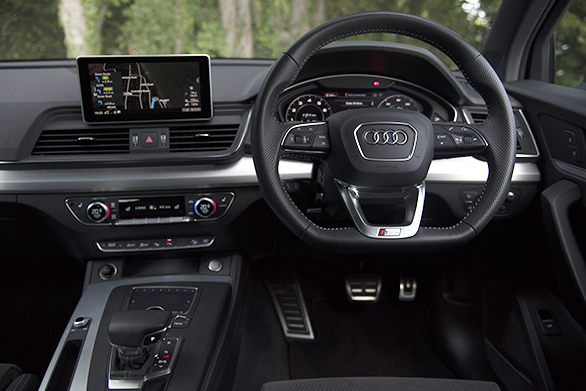 Again, not unseen before  in fact very similar to the new A4's interior which I personally loved. I'm not a big fan of the Mercedes-Benz like tablet screen which is a shame because some of Audi's screen integrations have been amazing like the A3's sliding screen. Audi has also refrained from using a touchscreen which I think is a good move. I find using touchscreens very distracting while driving and much rather prefer operating knobs and buttons. Audi's Virtual Cockpit makes an appearance in the Q5 too which again is really good to look at with its bright colourful display, but I find it a tad distracting right before my eyes. Thankfully, you can toggle back to a more conventional view. The MMI infotainment system has been tweaked to make it more user-friendly, and it now incorporates the Audi Smart phone interface which caters to both Android and Apple. That's just great, Audi! Thanks for all the smartphone wars you'll now cause for your passengers. If Audi's ambient lighting is too inorganic for you, you can now enjoy a full-size sunroof that extends all the way to the back. Audi could've done well to make it idiot proof, for all those parents who let their kids pop out for a bit of air. All in all, the Q5 is what is always has been. The overall design isn't a huge transformation in that it hasn't lost its identity as a Q5, which is fair, but it's not going to win hearts with first glances. Is it the performance that's going to blow the competition away? Initially, India is likely to get two engine options - a 2l diesel and a 2l TFSI turbo-petrol, not new engines, but as Audi promises much better than before in terms of performance and efficiency. But that much you'd expect even with a facelift, let alone a generation change. Engines usually outlive cars and both these engines have quite a bit of life left in them. Our test car was propelled by the 2-litre, 4-cylinder TFSI engine that now produces 252PS of max power and 370Nm of max torque. 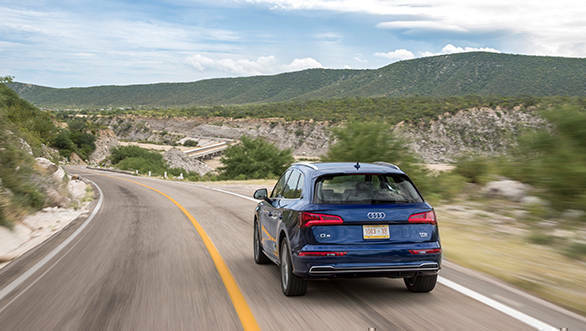 It comes mated to the VW family's 7-speed dual-clutch automatic which helps put down power in conjunction with the on-demand quattro all-wheel-drive system. Power is up by 27PS from the outgoing version but this gets spread out in the ratios, so you won't immediately notice it. The alternative fuel-efficient diesel option is good for 190PS, and I'm told it is sufficient for almost every requirement thanks largely to that 7-speed DSG gearbox. 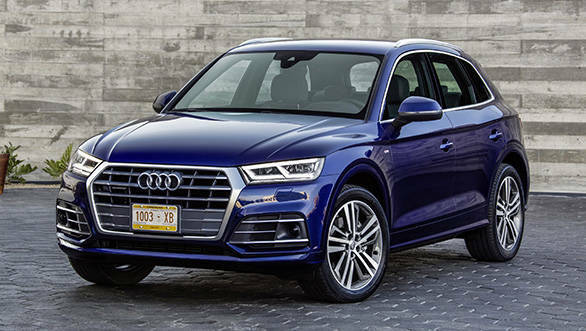 Of course, if Audi really wants to befriend the growing population of enthusiasts in India, we should see them introduce the SQ5 which brings the big daddy of the TFSI family to the party  the 3-litre turbo V6 that churns out 354PS  and the new 8-speed tiptronic transmission. But that's for later, both engine options offered at first are expected to be more fuel-efficient and perform better  as you'd expect from the timely engine tweaks. But again, these aren't enough of a knockout punch; they're more technical jabs that will earn the Q5 some technical points. Apart from the engines, the other thing that Audi did not have to do much to was the quattro all-wheel-drive system, which has widely grown to be accepted as one of the best traction aids in the market. The bit of fine-tuning they've done has resulted in smoother transitioning from the efficient front-wheel-drive set-up to the all-wheel drive, but can you and I tell the difference? Probably not. What you will notice, however, is the new multi-link suspension set-up with the optional air suspension which has made the ride quality and transfer of weight noticeably more pliant. You can feel the suspension complying with the quattro system more amicably when you chuck the car into corners, pretending it's a low-slung sportscar. It'll play pretend along with you, keeping things tidy and under control. What also helps is that the new chassis takes away 90kg from the Q5's kerb which helps it behave on the road the way it does. I couldn't spend much time in the back seat, but my seemingly fresh photographer slept through most of the fun part of the drive and that told me it was a comfortable place to be in. The real test, however, will be Indian roads. The Q5 has always been known for its rear passenger room and with the bigger dimensions, and the large greenhouse area with the expensive new sunroof makes the Q5 feel even roomier. My apprehension about taking the car off the road thanks to the insurance policies of the UK also means that you'll have to wait for our India road-test report for its abilities off the road. As much as I am enthralled with the ride and driving characteristics of the new Q5, I still don't believe it is the unique selling point of this new-generation Q5. It is still winning smaller battles with performance, interior comfort and dynamics, but these still won't win it the war. What will win it the war? We knew coming into this test that it would be ludicrous to expect Audi to drastically improve upon the Q5's strong suites. They've done a very good job, mind you, fine-tuning everything that much closer to perfection. At least as far as I can tell in this short first drive. But the new Q5's pièce de résistance and choice of primary weapon to regain its crown and keep it is the on-board technology that makes driving such a breeze. Everything from the heads-up display, the virtual cockpit, the predictive navigation, to the changes made to the MMI infotainment system integrating the new smartphone interface - everything almost makes the car an extension of the driver. In addition to the quattro and the optional air suspension, the adaptive cruise control is the step right before completely automated cars. It accelerates and slows the car down based on judging the distance from the car in front and its speed. Although, it doesn't pick up motorcyclists so on Indian highways, it is imperative that you don't overly rely on it. The predictive efficiency assist also brakes for you in emergency conditions. Now, it remains to be seen how much of this technology makes it to the Q5 when launched in India - not because of Audi's reluctance to bring in a high-specced version to India - but because Indian laws are still a bit controversial around radar-based technologies. The camera-based or infrared sensors are cleared, so it will have to be seen what the Indian Q5 carries. Muhammad Ali lost his comeback fight to Joe Frazier in 1971 but then went on to defeat Frazier twice and regain his heavyweight title against George Foreman subsequently. Can the new Q5 emulate such a feat in the automotive heavyweight division? In its new generation, it most certainly is in the best form it has ever been in, but its competition has evolved too and so has the game.